Can Chelsea stop the Manchester City juggernaut? You are here: Home ∼ Can Chelsea stop the City juggernaut? Can Chelsea stop the City juggernaut? All of Liverpool will be hoping that it’s the blue of Chelsea and not that of Manchester City to pick up the three points in the big English Premiership game of the weekend, writes GARY LEMKE. City bounced back from a surprise defeat at Newcastle to resume normal service with victories over Arsenal and Everton, and with Liverpool dropping points against both Leicester and West Ham, suddenly it’s tight again at the top of the table. Liverpool do, however, have a game in hand and this weekend they ought to see off Bournemouth at Anfield, which will give them a three-point lead ahead of Monday night’s big encounter. Should Chelsea do the unthinkable and derail City at the Etihad Stadium, then Liverpool would enjoy a three-point lead with a game in hand, making it advantage Reds as we head for the real defining moments of the season. Therefore every Liverpool fan will be wishing on the London club, they themselves still in the running for a Champions League spot, on Monday. That’s probably wishful thinking though, because Maurizio Sarri’s men have become inconsistent and jittery of late – and there’s further talk that their star man, Eden Hazard, will be off to the white of Real Madrid for £100-million at the end of the season. 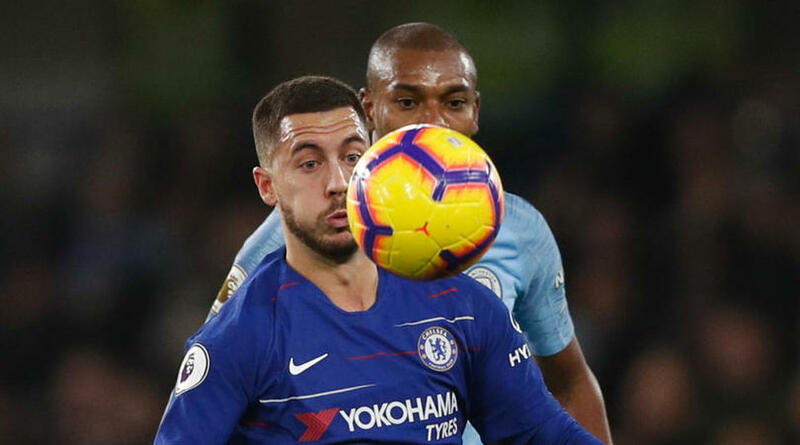 For Chelsea to go to the Etihad and get a result they’re going to have to raise their current game, although perhaps telling is that in the reverse fixture earlier this season, City were dealt their first defeat of the season, a 2-0 loss at Stamford Bridge. For Superbru players it might be worth taking note that of the last seven League meetings of these two clubs dating back to 2015, City have won four and Chelsea three, with no draws. This corresponding game last season saw City edge it 1-0. Liverpool have been surprisingly held in their last two games, but mid-table Bournemouth shouldn’t be able to slow their progress this weekend, especially given that the visitors are much better when playing at home, and not nearly as effective on the road. Elsewhere in the Premiership, third-placed Tottenham had to leave it late to see off Newcastle last week, and there’s no doubting that the absence of the injured Harry Kane has blunted their firepower, while Dele Alli remains on the sidelines as well, so Leicester might fancy their chances of returning from London with something to show. Both Man United and Arsenal will be looking for Chelsea to slip up at the Emirates on Sunday, and in any case United should go fourth on the table for 24 hours at the very least. United go to Craven Cottage to take on 19th-placed Fulham, who are starting to look more and more like relegation candidates, having slipped seven points off of safety. Huddersfield are doomed, and hosts Arsenal, who should join Chelsea on 50 points because one can’t predict anything other than a resounding victory for the Gunners.